Docker is up, and we have a Docker base box for Vagrant, is time to face the problem to move all to a cluster solution: Swarm. Swarm is a simple and fast cluster solution from Docker, when a container is raised Swarm select where (usually with lower load) and we can update network configuration in all the nodes in one time. To deploy Swarm we use Puppet. Puppet is a powerfull tool to manage and orchestrate a datacenter, we really don't need this tool to raise Swarm, but will need it in a short future to make complex labs. First. As we do in Stage 2.1 is time to do a Swarm base box to make this and future labs faster. 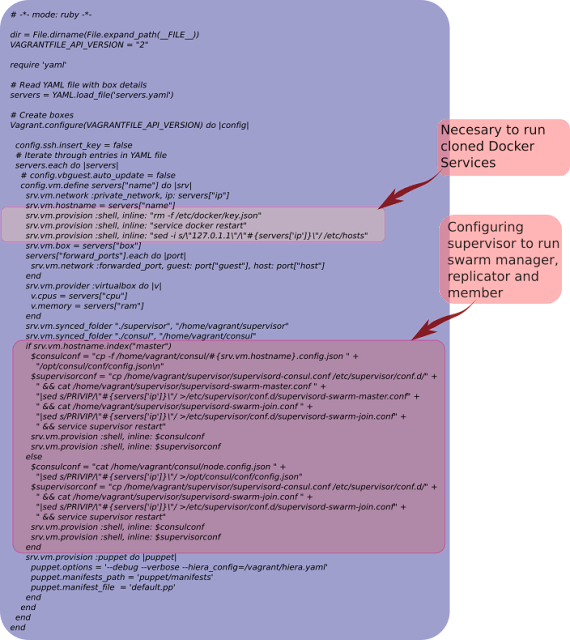 scotty-docker_swarm is a puppet plugin to raise Swarm, the command automatically install the dependencies, one is garethr-docker plugin, necessary to raise and configure Docker containers. With the plugins loaded the next stage is the second box. 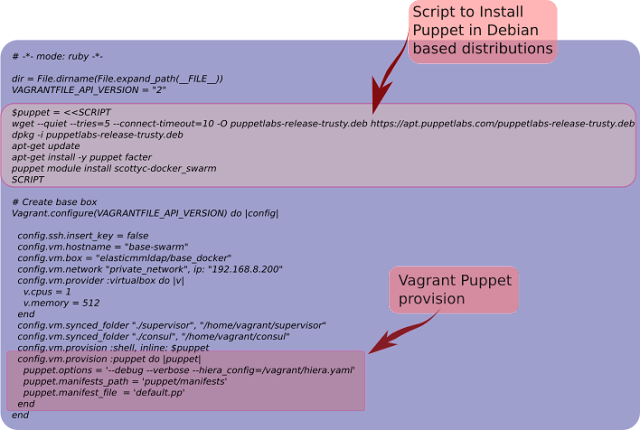 In the provision the VM apply a puppet manifest, the default manifest must be in puppet/manifests/default.pp. Almost near to have the Cluster running, we need now to connect all the services. All the Docker are using the local Consul node and there are three swarm services to raise. In all the nodes there are a Swarm agent to give cluster service to Docker, and in the master nodes, two services more, replication and master, needed to manage the cluster distribution and information. I select to use supervisor to raise the swarm services because I want to run the services in start up and with independence of the Ubuntu release. The needed changes in the Vagranfile to let cloned Docker to run correctly and the part to configure supervisor with the swarm init scripts.